A little not-so-good news for T-Mobile customers hoping for the next iPhone to officially arrive on T-Mobile’s network. 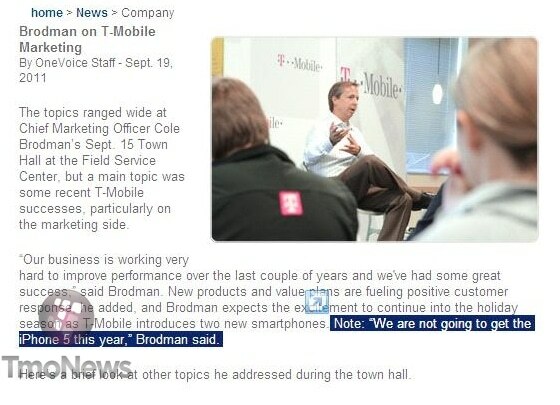 The disappointing news is that T-Mobile Chief Marketing Officer Cole Brodman told T-Mobile employees during a town hall meeting that T-Mobile won’t carry the iPhone 5 this year. But is that really a bad thing? That statement does not necessarily mean that T-Mobile is not going to get any iPhone this year, probably no carriers will. There have been a lot of rumors pointing out that there will not be an iPhone 5 this year, instead Apple is likely to release the iPhone 4S.